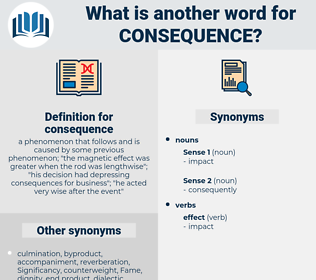 What is another word for consequence? a phenomenon that follows and is caused by some previous phenomenon; " the magnetic effect was greater when the rod was lengthwise"; " his decision had depressing consequences for business"; " he acted very wise after the event"
reason, consistency, wake, conclusion, continuation, significance, importance, owing, coherence, response, by-product, inference, fact, suite, connection, extension, accordance, virtue, incidence, follow-up, resultant, continued, pursuance, root, reflection, basis, relevance, context, offshoot, account, implementation, light. Resulted, Caused, triggered, Attributed, Prompted, rooted, Meant, Brought, linked, Died, driven, realized. unimportance, inception, beginning, start, cause, rise, insignificance, commencement. opprobrium, retiringness, consideration, self-distrust, ground, determinant, base, source, submissiveness, shyness, timidness, unassumingness, valuelessness, disgrace, inspiration, origin, puniness, anonymity, humility, meekness, shame, passiveness, stimulus, quietness, diffidence, modesty, mousiness, discredit, impetus, ignominy, odium, bashfulness, spring, foundation, disrepute, reservedness, factor, passivity, instigation, self-doubt, basis, infamy, groundwork, demureness, mother, incentive, timidity, obscurity, paltriness, unpretentiousness, dishonor, worthlessness, root, reserve. That word was of no consequence. But I do not admit the consequence that we should throw open our country to them. chungking, changing, Chang Jiang, conscience, Common Amsinckia, commonsense, chain gang, chicken snake, chunking, consuming, coenzyme q, cognisance, cenogenesis, Chinese Anise, chongqing, common camas, common sense, Cygnus Cygnus, cosmogonic, conciseness, Congo Snake, Camassia Quamash, common nuisance, changjiang, cosmogenic, consensus, consciousness, cognizance, chin-wagging, cainogenesis, consonance, cyanogenic, caenogenesis, chain-smoke, commissioning. fallout, byproduct, by-product, product, materialization, outgrowth, brisance, change, harvest, side effect, impact, influence, branch, Coriolis Effect, dent, offset, offspring, wallop, spillover, placebo effect, position effect, backwash, offshoot, domino effect, bandwagon effect, response, repercussion, knock-on effect, coattails effect, aftermath, reverberation, wake, aftereffect, butterfly effect, materialisation.